Run away. Run away from everything, from civilization and its discontents, to a place where you can live freely, naturally, and without sin. But be aware that once you get there you will ruin it by your very presence. The world of men will catch up with you and drag you out, and in the process they will poison your frail paradise with their violence. That’s the wish and the warning at the heart of every Terrence Malick movie. Somewhere in every one of his films there’s a Garden of Eden, near or far, that’s part temporary refuge and part prelapsarian vision. In Badlands it’s a tree house hidden in the woods. In Days of Heaven it’s a mansion in the Texas wheat fields. In Thin Red Line it’s a Melanesian village on Guadalcanal, an oasis of peace in the heart of war. In The New World it’s the whole North American continent at the moment of its discovery. In The Tree of Life Eden is harder to pinpoint, because it seems to be everywhere. It’s in the Waco, Texas of the 1950s, the landscape of Malick’s childhood, and in his lovingly recreated family home. But it’s also the whole universe, marvelous and benign in Malick’s vision, whose creation and destruction bookend the movie, and it’s present in a mysterious realm that exists either in memory or the afterlife, where his family gathers for an angst-free beachside romp. The only place it definitely isn’t is present-day Dallas, where Jack, Malick’s architect alter-ego (played by Sean Penn), struggles with recollections of loss and the spasms of ennui engendered by tastefully designed, sparsely furnished rooms. The ennui might be a bit much, but the loss is real: from the prologue to the film, we know that Jack’s brother R. L. committed suicide at the age of nineteen. In Jack’s memories (the bulk of the film is an extended flashback, experienced it seems, while riding toward the sky in a glass-paneled elevator), R. L. is an angel with straw-blond hair, shy and noble, unbendingly moral and good at classical guitar. And seen across the grief of fifty years, why shouldn’t he be? But Jack’s mother (Jessica Chastain) is even more angelic. Tall and pale with flowing red hair, she’s the image of soulful, sexless, world-embracing motherhood. At different moments she dances in the air and sleeps in a glass coffin like Snow White. She keeps her perfect feet bare. For an extended sequence young Jack admires them as she washes with a garden hose in the front yard. She tells her boys that there are two ways through life, “the way of nature and the way of grace,” and that the sky is where God lives (someone is always saying something like this in The Tree of Life, and all of Malick’s films are awash with whispered profundities). Naturally, she is on the side of grace. Jack’s father, Mr. O’Brien (Brad Pitt), is the only member of this family besides Jack endowed with the human weakness of greed and wrath (oddly, there’s also a third brother in the house, Steve, who doesn’t get much screen time and whose presence feels like an afterthought). O’Brien works as an engineer in an oil refinery and is frustrated by his station in life. In his youth he wanted to be a classical musician. Now he designs inventions that he can’t patent and plays Bach on the church organ when no one is around. He bullies his kids about posture and comportment and tells them they need to fight to get ahead in this world. He metes out petty punishments when they break his rules and plays Toscanini on the stereo at dinner to show them what real excellence sounds like. As played by Pitt he’s a man at war with himself, the only member of his family touched by doubt, self-loathing, or bitterness. He’s also the only person in the family whose public self is at odds with his private self. Outside the house he’s a sarcastic glad-hander; inside, he veers between fragile affection and bluff tyranny. Sometimes he combines the two, as when he orders his sons to kiss him goodnight. As young Jack (Hunter McCracken) grows up, he’s torn between the warring influences of his parents, between his mother’s injunction that he embrace the world and love openly, and his father’s wish that he make a space for himself through force of will. The bulk of The Tree of Life (roughly the central hundred minutes or so) is taken up with the story of Jack’s maturation — not exactly the path to manhood, but from naïve childhood to what you could call skeptical childhood. Jack loves his mother (to a degree that seems Oedipal), but he’s more like his father, and knows it. He starts acting out, throwing rocks through windows and torturing animals with the neighborhood kids. At one point he breaks into a wealthy home and steals a beautiful woman’s nightshirt. The shirt is beautiful too, and rather than defile it in any way he puts it in the river and lets the current take it away. At the height of his villainy he hurts his brother, exploiting the younger boy’s belief in his absolute goodness. For a second it seems like Jack has finally done it, done something really evil — but no, the hurt is minor, and before long Jack is helping the neighborhood cripple make toys and hoeing the cabbage patch with his father in the garden. 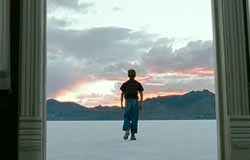 All of the long passage in The Tree of Life devoted to Jack’s childhood is finely observed and beautifully filmed. It’s also relentlessly, exhaustingly pretty, and weirdly cut off from the rest of the world. Practically every shot is bathed in golden light and plays to the accompaniment of swelling classical music. All that beauty comes at a cost: by making each individual moment beautiful, Malick robs them all of their power. 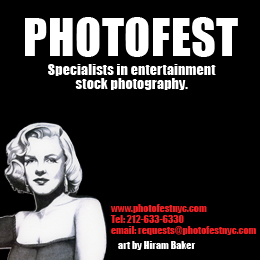 As a visual style, it creates a dominant mood of spiritual bombast and honeyed nostalgia. Even the strongest performances have trouble standing up to it. Brad Pitt, with his rage and confusion and incremental decline, does, and so does young Jack, at times — Hunter McCracken does an excellent sullen brood — but R. L. and the mother get swallowed in the picturesque tide. A little contact with the outside world would have helped. Malick focuses his attention almost exclusively on the O’Brien family home. It’s a kind of bubble, which makes sense, since childhood is a kind of bubble, with its own languages and rules and hierarchies. But the few glimpses we get are oddly frustrating. Each bears a heavy allegorical load, filed under “the loss of innocence.” In one scene, the boys witness a girl’s death at the county pool while their father tries helplessly to save her. In another, the boys go into town with their mother and see some men being taken away by the police. It’s hard to tell whether they are drunks, protesters, homeless, or crazy. The very fact that it doesn’t matter who they are or what they’ve done turns them into abstract symbols of injustice, as impotent as they are opaque. The other odd thing is the suppression of popular music in the film. The flashback in Tree of Life is set sometime around 1955 — exciting times on the radio, of which we get not a taste. Did they play Chuck Berry in Waco? If fifties suburban Waco is Malick’s own Garden of Eden, would Elvis have been his serpent? Could Little Richard have been his apple of knowledge? It isn’t hard to guess why Malick maintains radio silence: just a few seconds of “Tutti Frutti” would have shredded Tree of Life‘s carefully tended atmosphere of pantheistic reverie. And reverie — at the miracle of existence and the mystery of the universe — is very much what the film is about, which I think is why Malick takes the fairly audacious step of filming the history of the universe from birth to extinction. 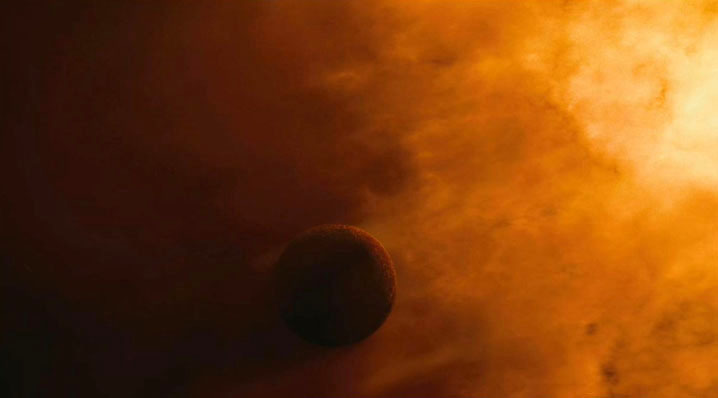 Malick doesn’t look for the universal in the particular so much as equate the two: nebulae glow with womb-light, interstellar dust resembles clods of sperm, the birth of a child is the birth of the cosmos; a single death is like the annihilation of the solar system. The Tree of Life begins with a quotation from the Book of Job, “Where wast thou when I laid the foundations of the earth?” and then answers its own question with a prolonged cosmic barn-raising. A mix of old-fashioned special effects, Hubble Telescope stock photos, and walking-with-dinosaurs animations, the sequence presents a providential history of the universe as a spectacle culminating in the creation of Sean Penn. Life arises out of a mysterious swirl of bubbles. Amoeba devour bacteria before evolving into fish. An asteroid plummets into the Earth, saving us all from dinosaur hegemony. In the strangest scene, set in the jungles of Mesozoic Texas, a predatory dinosaur comes upon a dying herbivore. Instead of going in for the kill it lays a comforting paw on its head. Is it acting out of compassion? Does the way of grace extend all the way down the evolutionary ladder to Troodons, or are we inside Jack’s imagination, watching his own Christian-inflected prehistoric fantasia? Things get even harder to sort out toward the end, when the adult Jack reunites with his loved ones in a dream space that seems to exist outside linear time. Jack goes through an empty doorframe in the desert and emerges on a beach where his mother and brothers are there, all restored to youth and frolicking by the shore. With a few whispers, all Jack’s transgressions are forgiven. Flanked by angels, his mother cradles a glowing light in her hands and gives her son up to God. Clad in a shimmering white slip, she’s the Virgin Mary without the angst. Everything in The Tree of Life lacks a crucial dimension of angst. Malick invites us to marvel at a universe created for our benefit and an afterlife in which all our cares will be resolved. 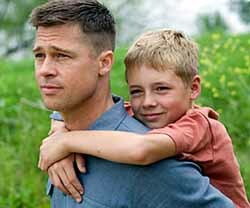 The best part of the movie — Brad Pitt taunting his sons, willing them to rebel against an authority he doesn’t believe he deserves — vanishes behind a scrim of inane space flotsam, while the combination of the two endows Jack’s childhood with a world-historical weight it can’t possibly bear. But then again, where would we be without risible notions? All of Malick’s movies (even Badlands, his best) suffer from an excess of high-mindedness. He tries to cram every beautiful thing he can think of into every scene. The archetypal Malick image, repeated here, is of trees shot from the level of the roots looking up, set to the accompaniment of classical music. A line of dialogue by Mrs. O’Brien — “Love everyone, every leaf, every ray of light” — might be the archetypal sentence. Malick’s guiding impulse is to submerge consciousness in nature, while keeping a hand on the most elevated products of human harmony. His films come from a point somewhere between Emerson and Rousseau: he’s always on the lookout for natural man and a pre-verbal contact with the substance of the universe. Sometimes he even manages to bite off a piece of the sublime, and he isn’t afraid to go too far or to risk being laughed at. He reminds me of D. H. Lawrence, and like Lawrence, no matter how tedious he can be he always finds space for something unexpected as well. I like it when Malick flirts with apocalypse. I like the locusts and the brushfires in Days of Heaven and the big artillery assaults in Thin Red Line. I like his little imaginary Edens, especially when they feature chickens, as in Badlands, or are surrounded by spooky cedar swamps (New World). I don’t like his too-wise-for-this-world kids, but I like his tongue-tied vigilantes. I don’t like his pacing or his preaching, but I do like Brooke Adams. In spite of myself, I like his flights of fancy. I like the troupe of Italian clowns descending on North Texas in Days of Heaven, and the baffled look on Colin Farrell’s face when he shows up in Greenland for three seconds. I even like the dinosaurs. The dinosaurs might just be the best part. Jacob Mikanowski is a graduate student in modern European history at U.C. Berkeley, currently living in Warsaw. 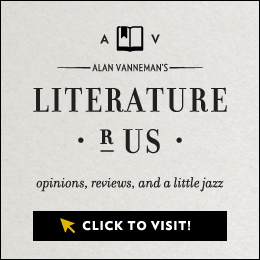 He writes about television, film, and the worst of the twentieth century. His work also appears in Bookslut.